This Chateau Belleview II tapestry shows the palace grounds of the castle of Madame de Pompadour, inspired by the tapestry designs by the Gobelins. The chateau was impressive and was built in the plateau of Meudon. The chateau had enormous grounds, as w can see here. In the foreground of this work celebrating this castle's beauty, we see a balcony scene of red and blue drapes, with a basket of flowers including sunflowers, and garlands decorating the scene from above, as they also wind around the columns. In the distance is the chateau among the forest clearing. 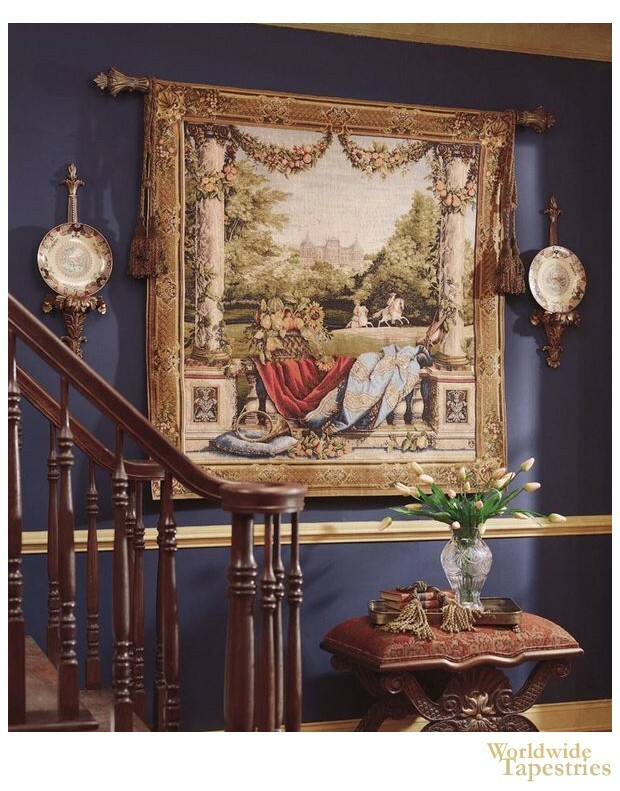 This Chateau Bellevue II tapestry is backed with a lining and has a tunnel for easy hanging. Note: tapestry rod, tassels and tassels where pictured, are not included in the price.